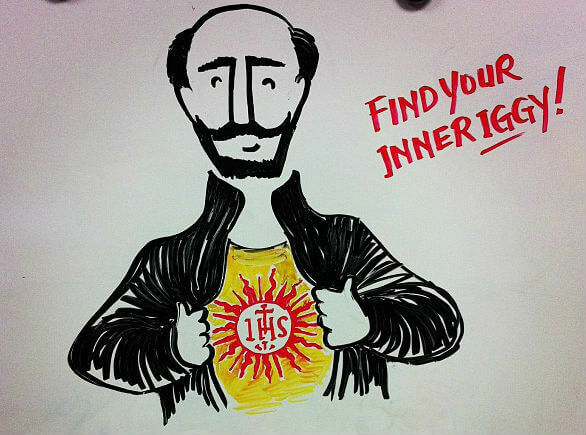 The second annual Find Your Inner Iggy celebration starts today and runs through July 31, the feast of St. Ignatius. Go to findyourinneriggy.com and answer daily questions about how you find God. Get creative and share on Instagram, Twitter, Vine, and Facebook, using the hashtag #FindIggy. Every day, Loyola Press will pick three of the best photos, tweets, posts, or videos and award them with Iggy bobbleheads, tattoos, and books. Last year’s Find Your Inner Iggy slideshows can be viewed here. Thank you for your feedback. 31 Days with St. Ignatius is based here on IgnatianSpirituality.com, so there is no need to use Facebook to participate in that. Just use the link in the sidebar to see the calendar. Find Your Inner Iggy is a social media event, but you can read the daily reflections without being logged in to Facebook, using the URL: findyourinneriggy.com. You can also enjoy #FindIggy conversation at the People for Others blog. Totally agree with previous post and wish there was a way to participate in celebrating 31 days with St. Ignatius of Loyola without posting this on Facebook and Twitter. But I guess this is a social media event and everything has to be shared on all these sites. For those looking for a different kind of retreat, a Jesuit friend of mine, Fr. Greg Carlson, S.J. just put together a great DVD: A Retreat with the Spiritual Exercises: Images, Poems, and Stories. He is an amazing homilist and expert in Aesop’s Fables. Enjoy! Thank you indeed. We don’t all like to splatter all over the Internet. Yuck. Is there a way to find this without having to put up with that Facebook? Yikes.